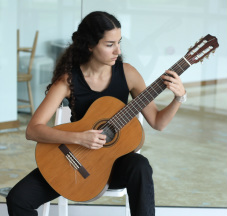 Carla Cao is a composer, clarinetist, guitarist, and field botanist. Having always been passionately in love with nature, she decided to study Biology at Florida International University with the intentions of becoming an environmental conservationist. Throughout these years, she worked as a field botanist in Everglades National Park and as a research assistant for botanical and ecological laboratories. To satisfy her passion for traveling, she spent summers backpacking, doing social work, and conducting cultural research in China, Peru, and Lebanon. Having always had music at the forefront of her life growing up, she decided sometime after her first Bachelor’s to enroll in the music composition program at New World School of the Arts College for a second Bachelor’s degree, which she completed in 2014. Her love and experience with nature, world cultures and spirituality translates into her music, making her pieces unique experiences, in themselves.